JCB added a 9.9-ton zero tail swing compact excavator to its compact excavator line. 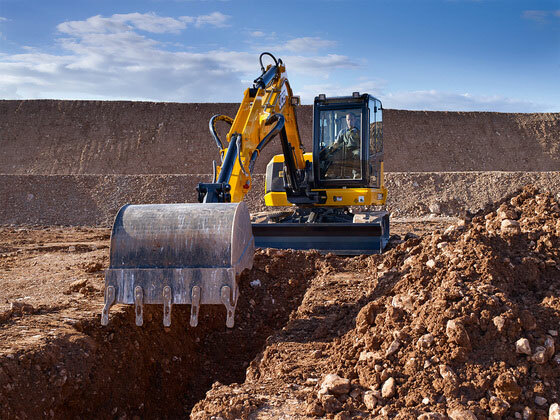 The 90Z-1 boasts a more powerful engine than the recently released 9.4-ton 86C-1, JCB said, with a larger dig end and increased hydraulic capacity. The 90Z-1 features a revised H-design undercarriage, steel body panels and a Tier 4 Final engine. The machine is powered by a JCB by Kohler diesel engine delivering 74 hp. Maximum tracking speeds are 1.6 mph to 2.9 mph. The machine’s “auto idle” feature can be set by the operator to initiate after two to 30 seconds of lever inactivity. There are also two digging modes, an ECO mode and a heavy mode, tailoring the machine’s performance to the application. The 90Z-1 is designed with a maximum digging depth of 13 feet 7 inches, a dump height of 17 feet 9 inches and a reach at ground level of 24 feet 3 inches. The cab comes complete with an ergonomic switch layout, a full-color LCD display screen, with an additional monitor for a rear-view camera, and a 12-volt phone charger.